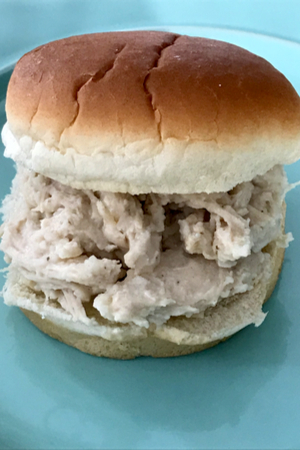 I have been eating shredded chicken sandwiches for as long as I can remember, but now that I have discovered how to make Instant Pot Creamy Shredded Chicken, it is my new favorite. One of the most popular, yet basic recipes for the Instant Pot is shredded chicken. 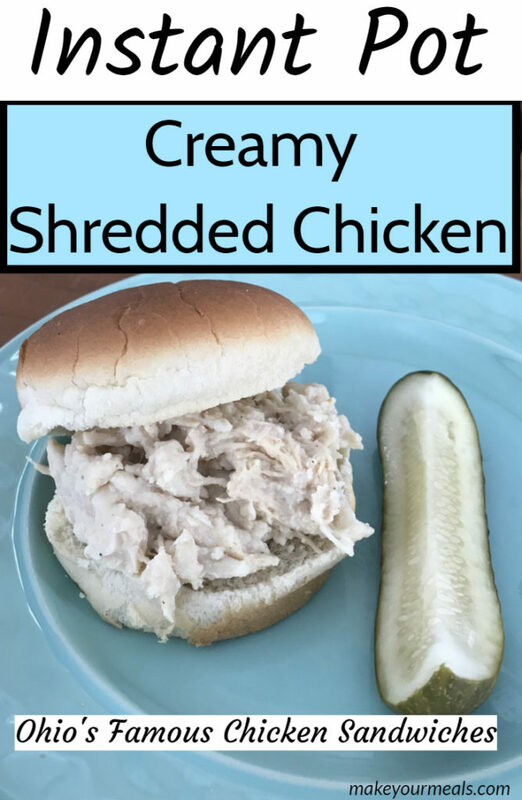 Instant Pot Creamy Shredded Chicken served as a sandwich. Just look in any Facebook group designed for Instant Pot recipes or questions and you will see hundreds, if not thousands pertaining to shredded chicken. 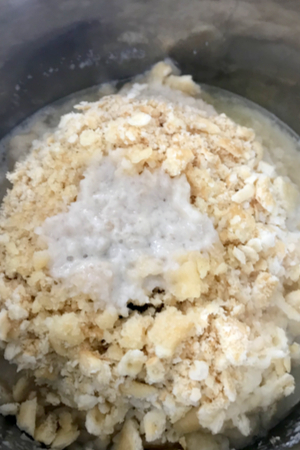 From how do I make shredded chicken from frozen chicken breasts to questions on why the cooked chicken is hard to shred and dry. Just take a minute to scroll through the page and you will find plenty! Rather than using a can of boned chicken, we use fresh boneless, skinless chicken. You could spend hours on those group pages! Not only are they full of good questions, but there are also some really good recipes that have been tested by their members. So what is all the fuss about shredded chicken? In general, chicken is much healthier than most types of meats. It has gained a lot of popularity over the last several years in terms of ‘healthy cooking’. However, chicken is not the easiest cut of meat to cook to perfection. Shredded chicken at a fraction of the cost of canned chicken. Because it is a lean cut of meat, it can dry out quickly during the cooking process. That is why you will find several questions inquiring how to successfully cook chicken. 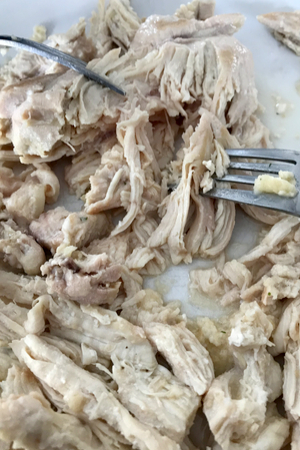 Because the Instant Pot is a pressure cooker, which uses liquid to cook under moist conditions, it provides the perfect environment for shredded chicken. But when you think about shredded chicken, what do you think of? Most of us will immediately think of pulled barbecue chicken sandwiches. A sleeve of Townhouse crackers ready to be crumbled and added to the recipe. But there are so many other uses for shredded chicken. And you are going to love this Instant Pot Creamy Shredded Chicken recipe. We grew up eating creamy shredded chicken sandwiches all the time. At every family get together, picnic, graduation party and birthday party, you can be sure that there would be a crock pot full of shredded chicken ready to be served. Most often there would be a package of hamburger buns right next to the spoon that stirred the pot. Add the butter on top of and around the chicken. Just pour a large, heaping scoop onto the bottom of the bun, and you have yourself a classic creamy chicken sandwich. And for those that are watching their carbohydrate intake a large spoonful would be piled on their plate and be eaten with a fork. And sometimes, you would see others eating it more like a dip. I have seen others eat it using tortilla chips, crackers and even celery. But I was shocked to learn that this staple pot luck item was only served in the Ohio area. The lid has been removed after 10 minutes of Natural Pressure Release. 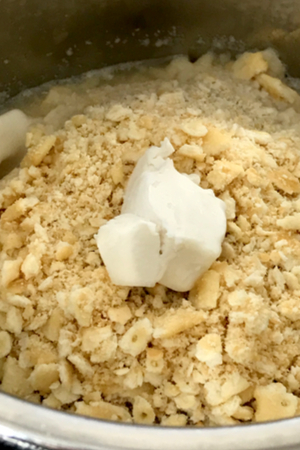 After purchasing my 6 quart Instant Pot Duo I began to search the internet on how to convert my favorite slow cooker recipes to the Instant Pot. Pot roast and vegetables, chili, meatballs, and of course, shredded chicken sandwiches. I had no difficulty converting my other recipes. I looked online to find similar recipes and adapted the cooking time as needed. But I could not find any recipe about the shredded chicken that I remembered. I easily found barbecue shredded chicken recipes. And I also found several shredded chicken taco variations. But not once, did I ever see anything that resembled creamy shredded chicken that we eat in Ohio. Once you add the milk you have Instant Pot Creamy Shredded Chicken. The basic recipe that I used for my slow cooker was almost too simple. Just three ingredients: a large can of boned chicken, cream of chicken soup and a sleeve of crushed crackers. So when I started asking the experts in the Facebook Instant Pot Groups, nobody knew what I was talking about. WHAT??? Didn’t everyone grow up eating shredded chicken sandwiches? The answer to that is absolutely not! Come to find out, that only those that grew up in central and northern Ohio were familiar with this dish. 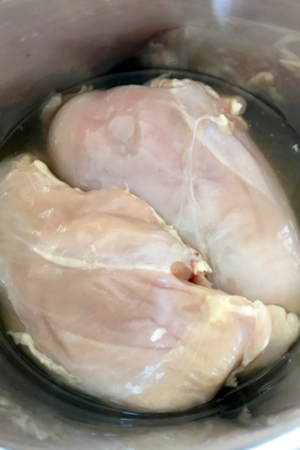 Wanting to keep the Ohio classic recipe alive and even revitalized, I was more than determined to convert this into Instant Pot Creamy Shredded Chicken. A scoop of creamy shredded chicken. Now the question was how to convert it to make it in my Instant Pot. I knew that I would have to add a thin liquid for it to come to pressure. And I was terrified of getting the dreaded ‘BURN’ notice. But all of my efforts to find a similar recipe failed. 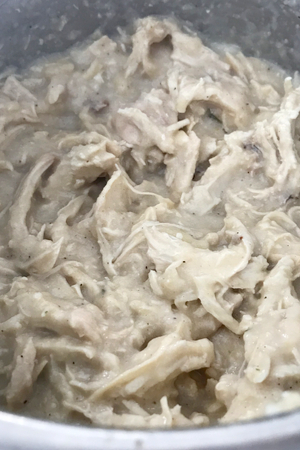 So I went to the drawing board to see what I could do to make this Instant Pot creamy shredded chicken a reality. I could have cooked the chicken in broth and once the cooking time expired, add in the cream of chicken and crackers. But I wanted the flavors to really infuse, rather than just be mixed together. The only solution was to make homemade cream of chicken soup. I added all the ingredients together and mixed the cream (aka milk) in at the end. The result….delicious creamy shredded chicken! I put a big scoop on a hamburger bun and I was in heaven! 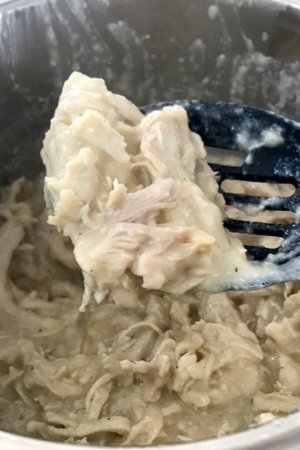 So next time you are thinking shredded chicken, give this instant pot creamy shredded chicken recipe a try! 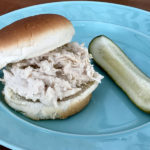 Famous Ohio creamy shredded chicken made in minutes in the Instant Pot. Served on a bun or over pasta or rice for a complete meal. In the liner of the Instant Pot, add the chicken broth. Place chicken pieces directly in the broth. *If your chicken pieces are thick, slice each one in half parallel to the cutting board. Sprinkle the garlic salt and black pepper in the pot. 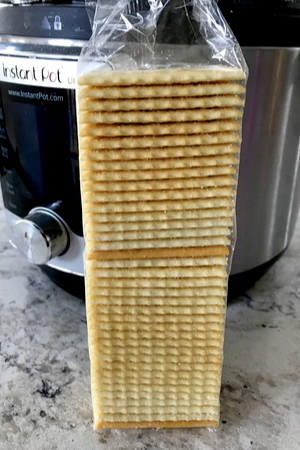 Crush the sleeve of crackers until they become small crumbs. Sprinkle on top of the chicken. Do not stir. Add the tablespoons of butter on top of the crackers and around the chicken breasts. Close the lid and place valve in the sealing position. Pressure Cook/Manual on HIGH pressure for 10 minutes. Once the cooking time expires, allow for 10 minutes of Natural Pressure Release. Release any remaining pressure. Remove chicken pieces and shred them with 2 forks. Add the milk and chicken back into the pot and stir. Season with salt and pepper as desired. Thicken with flour if needed. Serve warm on buns or over pasta or rice. Hi Jessie The flour is added only as needed to thicken the mixture. Can’t wait to try this. 3 pounds of chicken makes 4 servings? That seems like a lot of chicken. How many breasts/thighs did you use? Thanks!! If I use frozen chicken, do I need to increase the time or will the ‘coming to pressure time’ just be longer? Thanks! It will depend on how thick your frozen chicken is. If it is in a large clump, or if they are large then yes, an increase in time will be necessary. Thanks! They are the smaller skinless, boneless ones from Costco. Love your website! Hi Susan. Yes, I think I would add a little more broth next time. I haven’t tried the bone chicken, but am very interested in how it would turn out. There is typically so much liquid in there that I would probably try it without adding any broth at first. If you try it, let us know how it turned out!